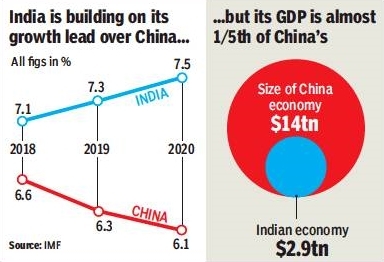 India’s economy is estimated to grow by 7.3% in 2019-20 and 7.5% in 2020-21, supported by robust consumption and impact of reforms, the International Monetary Fund said, enabling it to retain the tag of the fastest growing major economy in the world. Growth in China, the second-largest economy in the world, is forecast to slow to 6.3% in 2019 and to 6.1% in 2020. The bruising trade war with the US is taking a toll. The RBI had earlier lowered the GDP growth estimate to 7.2% but most economists agree that growth is poised for a rebound in the years ahead.